" Africa's rapidly changing environmental landscape, from the disappearance of glaciers in Uganda's Rwenzori Mountains to the loss of Cape Town's unique 'fynbos' vegetation, is presented today to the African Ministerial Conference on the Environment (AMCEN).
" 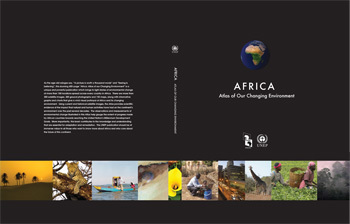 As the age-old adages say, "A picture is worth a thousand words" and "Seeing is believing", this stunning 400-page Africa: Atlas of our Changing Environment is a unique and powerful publication which brings to light stories of environmental change at more than 100 locations spread across every country in Africa. Using current and historical satellite images, the Atlas provides scientific evidence of the impact that natural and human activities have had on the continent's environment over the past several decades. This UNEP publication should be of immense value to all those who want to know more about Africa and who care about the future of this continent. 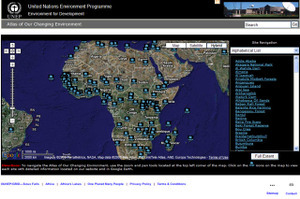 This site contains downloadable versions of the atlas in both English and French. Also included are powerpoints, posters, satellite images, graphics, and interactive maps. "